There’s always been a lot of controversy surrounding organic foods. Near my house, there’s a grocery store called Whole Foods, a national chain that sells primarily organic and natural products and calls itself “America’s Healthiest Grocery Store.” Its customers are willing to pay a little more—sometimes as much as two or three times the price of non-organic alternatives—for food they believe to be more nutritious and better for them and the environment. And although they may be right in thinking that organically produced foods are better for the environment, the evidence is not clear if organic foods are any healthier or nutritious than “regular” food. Most people, however, instantly make a connection between organic labels and a healthier, more nutritious option. This is called the “health halo” effect. A group of researchers from Cornell University recently explored this phenomenon by studying the perception people have towards food labeled organic. They set up a table with three pairs of food choices: two cookies, two cups of yogurt, and two servings of potato chips. The participants could either choose the organic option or the food labeled regular from each food choice. An overwhelming majority of the 115 subjects who participated in the study thought the organic samples were more nutritious, that they were lower in fat, and that they contained fewer calories. They were also willing to pay nearly 24% more for them! Here’s the shocker: The samples were the same. There was no difference between the items labeled organic and the other food options. If a food item is labeled organic, it means that the food is grown without the use of pesticides or chemical fertilizers, and isn’t subjected to any added hormones. Some studies have shown, however, that the chemicals used to grow and preserve food might not impact people. But organic-food advocates say they are healthier, free of chemicals, and—most importantly—not genetically modified. So far, the research is not conclusive—but if you want to just compare the nutritional value of organic and non-organic food, there’s no difference. Comparing the labels of organic peanut butter and natural peanut butter, for example, will yield the same results. Each contains 100 calories per tablespoon, four grams of protein, six grams of fat, and three grams of carbohydrates. The nutritional value derived from each is identical. It’s also important to point out that natural and organic do not mean the same thing. A peanut that was grown and sprayed with chemical fertilizers and pesticides can still be called natural. The jury on the nutritional benefits of organic food is still out. But I believe that research to date has not found enough benefits to justify spending the extra money. If you practice proper washing, handling, and preparation, don’t worry about eating “regular” food because it’s just as good for you! 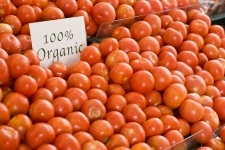 “Organic labels bias consumers perceptions through the ‘health halo effect,’” ScienceDaily web site, April 1, 2013; http://www.sciencedaily.com/releases/2013/04/130401121506.htm, last accessed April 10, 2013. “Is Organic Overrated?” ScienceDaily web site, May 23, 2009; http://www.sciencedaily.com/releases/2009/05/090521200017.htm, last accessed April 10, 2013. Gilbert, M., “Fitness Inventor,” Muscle Insider, 11:34.